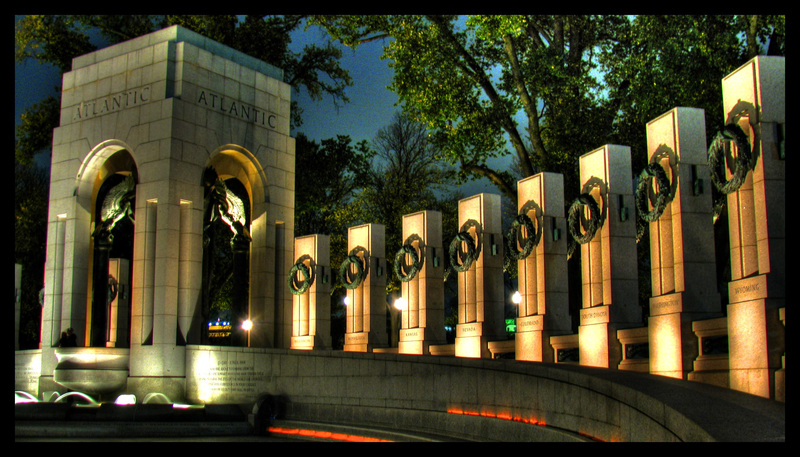 If architecture is, as Goethe put it, frozen music, then which classical opus is suspended within the granite semicircle of Washington’s National World War II memorial? To me, its bronze eagles, fountain sprays, and triumphal arches perfectly evoke "The Ride of the Valkyries." Not the original piece, made famous in Wagner’s eponymous opera, but the bizarro version screaming over Colonel Kilgore’s loudspeakers in Apocalypse Now: a death-from-above party jam meant to pump up our boys and send Charlie running for the hills. The structure is a pillared crown roast of Riefenstahlian bombast, derided by critics and unnecessarily cluttering space at the foot of the Washington Monument since its 2004 dedication. Perversely, considering its purpose, it is one of the most forgettable tourist stops on the Mall. Until the government shutdown! 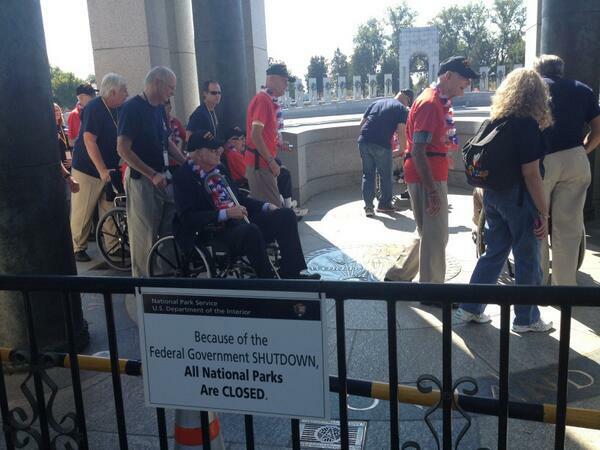 When veterans from the Honor Flight program staged their own Occupy movement inside the cordoned-off plaza, their noncompliance quickly became a cause célèbre in the national press. (Why cover the sick kids getting locked out of their government-funded treatment, after all, when beckoned by the siren call of a Republican congressman’s photo op?) Over the weekend, quasi-celebrities Sarah Palin and Glenn Beck returned to the memorial with a trash-pickin’, Confederate-flag-wavin’ cast of thousands (except there was no trash to pick up). Once we reach the inevitable Republican capitulation and government functions begin to shudder back to life, why don’t we just agree to leave the memorial shuttered? We could close it down for real this time, with electric fencing instead of … uh, traffic cones. Or perhaps it could be salvaged as a skate park for vandalism-minded youths. In that vein, we at The New Republic have noticed that some of the most destructive and extraneous functions of government, like the great concrete divot on 17th and Independence, have somehow avoided the long, skeletal arm of the shutdown. For your consideration, here's a host of programs and departments the American people would be better off without. As you read, think of how we could supplement our brave representatives’ salaries with the savings! Sure, it may seem like overkill to pick on the spooks. Ever since the summer’s PRISM revelations, even their staunchest supporters in Congress have begun to see the wisdom in maybe limiting the ease with which our intelligence analysts spy on their spouses. There was a time when farm subsidies, which annually put billions of dollars into the pockets of some of the nation’s wealthiest citizens, were justly decried as wasteful by members of both parties. That was before Republicans adopted their delightful “Costly Subsidies for Me, Grinding Starvation for Thee” policy and derailed this summer’s farm bill. Now it’s not even clear they can be used to buy off the usual list of Soy Belt hacks in return for food-stamp funding. These handouts are especially difficult to eradicate because they’re bound up with the equally asinine Iowa caucuses—presidential contenders can’t afford to alienate the voters by openly condemning one of worst federal programs. So why not ax the caucuses, too, unless someone can come up with a good explanation for why we hand the nuclear codes to someone chosen by a bunch of rural voters shuffling around a high school gym? Beloved of meddling grandparents and lunatic philatelists, the USPS is a bleeding bureaucracy that’s long been destined for the chop. Though the Postmaster General, Patrick “The Mad Irish Letter-Carrier” Donahoe, was able to forestall the elimination of Saturday delivery in April, the system still amounts to a Pony Express model crash-landing in the age of Twitter. Or phone calls, for that matter. Wait, why wasn’t this thing killed off by Morse code? Sentiment alone casts the Postal Service as merely a steward of personal correspondence; their main customers are major banks and Netflix, and even those guys probably wouldn’t suffer if service were curtailed. And to anyone wondering whether I’ll miss the quaint romance of the hand-written letter, let us know the next time you receive anthrax by email. The most compelling argument against capital punishment is the specter of wrongful execution. Our justice system that will always be plagued by incompetent defense attorneys, prosecutorial misconduct, and racial bias, and therefore can’t legitimately administer a punishment that demands infallibility. The federal death penalty is different: its comparatively fewer executions (just three have been administered since 1963, including that of Timothy McVeigh), higher-quality counsel, and more quixotic list of capital offenses (among them genocide and kidnapping the president) means that the system is far less prone to abuse—though doubts surrounding federal defendants have resulted in sentences being commuted. Even if we could be assured that the United States only put guilty people to death, however, there would still be the issue of cost. The median federal death penalty case is eight times more expensive than one in which capital punishment hasn’t been authorized; the cost of attorney hours and expert testimony regularly pushes the bill up to over $600,000. Why are we paying that much, per case, for the privilege of erasing the life of one of our fellow citizens, no matter how detestable? Taxpayers spent $60 billion on the TSA in the decade following 9/11, or roughly enough to try 100,000 death row prisoners. For that sum, we’ve bought years of body scanner lines, racial profiling, bomb-sniffing dogs, and all the other hallmarks of American Security Theater. At this point, high school freshmen have never lived in a world where air travel didn’t necessitate the surrender of their shoes, belts, beverages, and dignity to a TSA employee. And the only two serious threats to an airplane during that time, Richard Reid and Umar Farouk Abdulmutallab, were both stopped by passengers. By far our most counterintuitive proposal. It was the House of Representatives and its Republican majority that got us into this mess, of course, so why abolish the Senate? The answer is that it’s the most fundamentally undemocratic institution in American government. The Electoral College, whatever its faults, has only handed the presidency to the wrong candidate four times out of 57, for a sterling 93 percent accuracy rate. By contrast, every time the Senate takes a vote, it awards the people of Wyoming—a lovely and pastoral place where nobody is known to live—68 times more representation than those of California, our largest state. If places with small populations are privileged over those with enormous ones, our legislative branch is officially serving arbitrary geographical designations rather than the people who make their homes there.